Am I the poster child for kale or what? 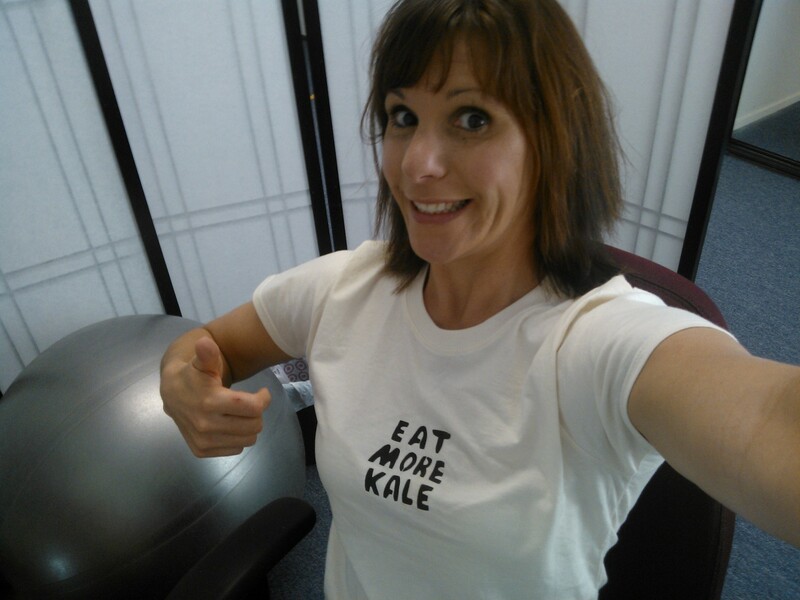 If you too want to wear your love of kale on your chest, support a good cause and go here to buy one of these babies. So, the next question is…HOW do I eat more kake? Answer: It’s so easy! Kale goes with everything, even chocolate. Yep, I’ve downed my share of chocolate protein shakes with kale included and I swear, you don’t even taste it. Promise. 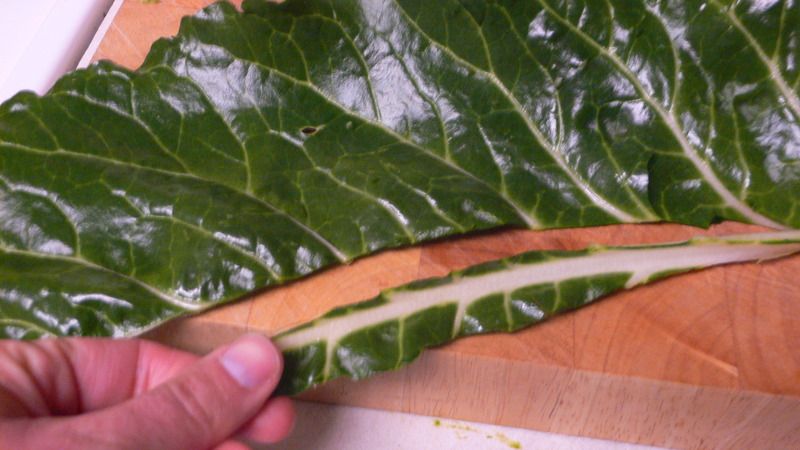 My favorite kind of kale is Lacinato kale, AKA Dino kale. It’s easy to work with because the leaves are soft and less ‘wrinkly’, but in general I’m an equal opportunity kale consumer. Mix the spices, cilantro, scallions with the oil and lemon juice in a bowl, set aside. Toss the corn and beans with the quinoa. Add the oil/lemon and mix half-way. 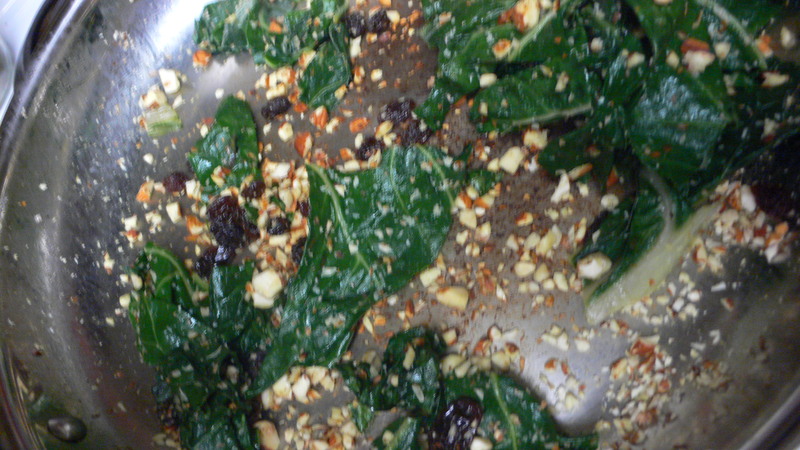 Add kale and mix in thoroughly but try not to ‘mush’ the salad – toss lightly. Chill and let the spices sink in! Enjoy. This makes about 5-6 cups of salad, and I think it pairs nicely with white fish, such as Tilapia. Today I had a culinary epiphany. 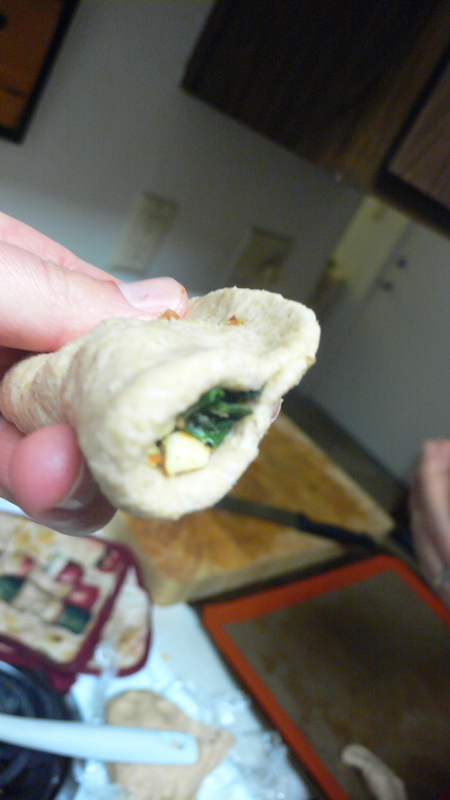 Why not blend a simple Spanish-inspired Swiss chard recipe with the equally simple recipe for soudough rye pizza dough? Why not, indeed. The combo was divine and oh so very easy to achieve, assuming you have a sourdough starter. Don’t have a starter? Check out Wild Fermentation. I’ve had my starter about 2.5 years, thanks to a grad school friend. Mix the flour, salt and starter in a bowl with a wooden spoon. Add the water until the dough is somewhat sticky but not too moist. Mix well. Add the olive oil and knead for about 4-5 minutes. 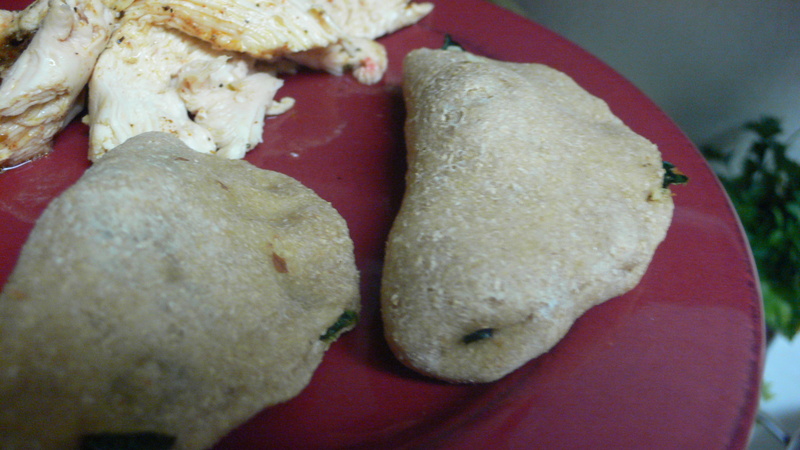 The dough will get a bit plastic-like in texture. You may need to add in more flour. Roll into a ball, cover with oil (lightly) and then put in a bowl, covered with plastic or cloth. let it rest 30-minutes. Heat the butter in a large, wide skillet. Add the remaining ingredients, cooking and mixing well on med heat for about 5 minutes. Next, bake for about 6-minutes at 375, careful not to over cook. And finally…ENJOY! It’s no surprise to you that we, on average, are a little light on the vegetable side. According to the 2011 statistics, the majority of us are either overweight or obese. Off-white eating alone won’t necessarily prevent weight gain. Whole grain flours, natural sweeteners and unrefined foods are just as calorie-dense as the white stuff (but they have fiber, are more filling, and have valuable nutrients so don’t you dare stop eating them!). But, let’s get real. You gotta each some veggies too. Not just some, but actually a lot of veggies – like 2-4 cups/day of veggies. Like veggies at every meal every day. Yeah, it’s no easy feat. But we can do this together, I promise. Oh, and they say that the #1 vegetable consumed is….wait for it….POTATOES! Yep, you probably knew that. French fries are the #1 vegetable consumed, if you can even really count that as a vegetable. With things like French fries and ketchup counting as vegetables we are going to be in a sad state unless we change our approach to vegetables. So, I have a solution. Since we apparently love potatoes, but need to eat more veggies, why not find foods that bridge the gap. For instance, this potato-sneak-a-peek-leek soup. Not only does it have potatoes, but you get a peek of asparagus, kale, parsley, and onions also. But just a peek, because they are almost all pureed in with the potato, so you won’t even know it’s there. Trust me. This soup is so dang tasty and is especially nice with Aidell’s Chicken Sausages. Yum. 2 large leeks, the dark end trimmed off and the white part cut in half and cleaned thoroughly. In a large stockpot, heat the oil on medium heat. 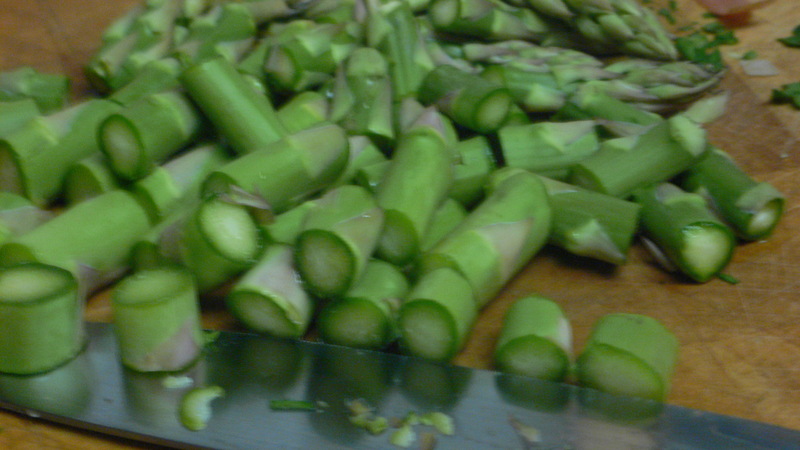 Finely chop the leeks. 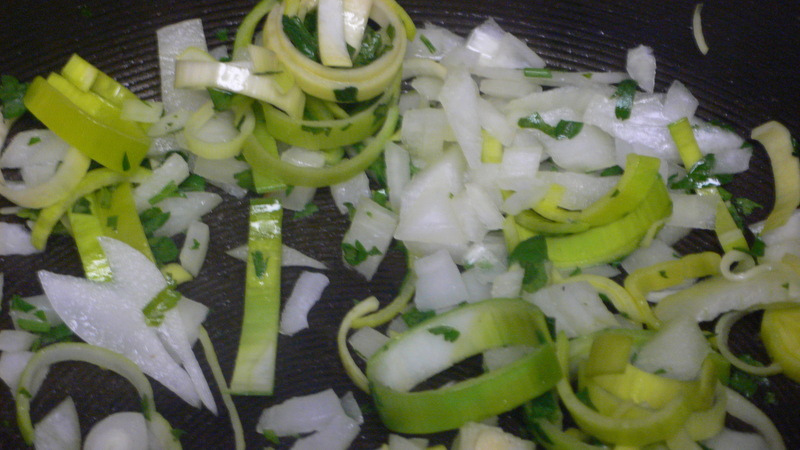 Mix the leeks, onions, parsley and spices into the stockpot. Cook on med for about 5 minutes, stirring about every 30-seconds. Once added, mix in the stock and water. Bring to a boil. Once boiling, add the chopped potatoes and stir. Cook, covered, for about 20-minutes. Check to ensure the potatoes are soft but not mushy. 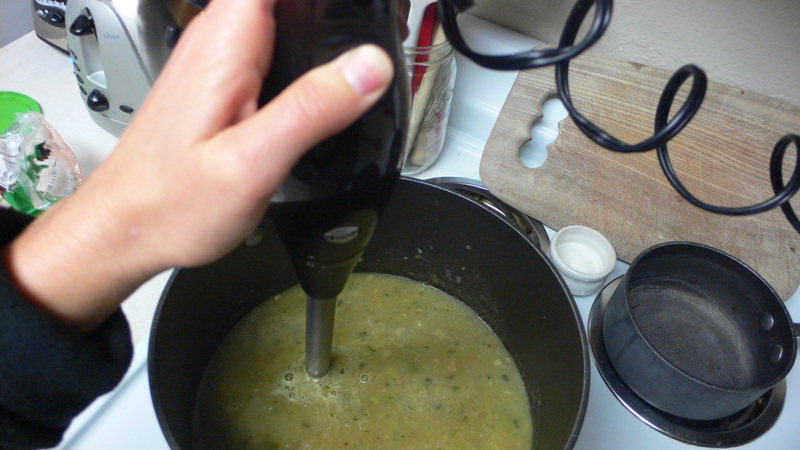 Next, use an immersion blender to puree. If you don’t have one – get one. I have the Food Network imimmersion blender. It’s okay, but I’d rather have the Cuisinart. If you can’t get one, they you can put the soup in the blender and pulse for a few seconds. And finally, add the kale. 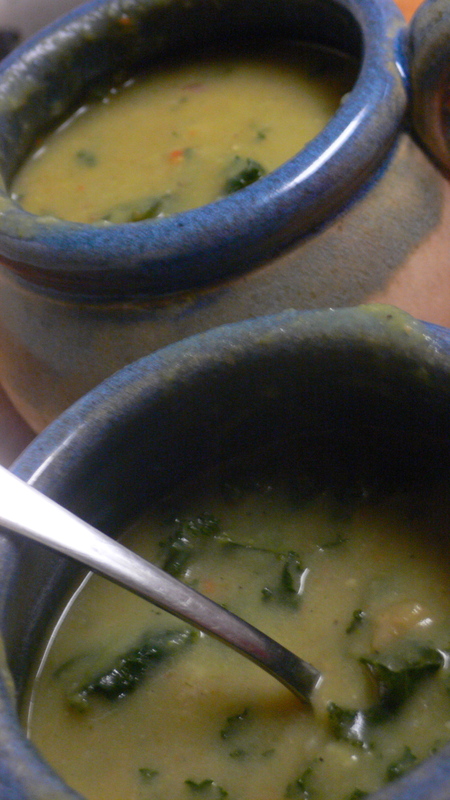 I prefer the texture of the soup with the kale unblended, but it’s up to you. And, lst but not least…ENJOY! Tis the season! For me this time of year begins a month long nostalgia for baked treats and sweet goodness from my childhood. In the Fellows household (my maiden name) we started baking before the Turkey was in the oven on Thanksgiving and didn’t stop until the champagne glasses clinked on New Year’s eve. Oh, the heavenly smell of baking chocolate chip cookies and the divine taste of mom’s homemade “See’s Candies”. Yes, friends, those were high times. Nothing was so great as plopping into bed with sugar-induced food coma brought about by frosting sugar cookies (one spoonful for the cookie, one for me) or mixing up the batter for decadent treats like “Brownie candy” and homemade caramel popcorn. Yes, we went all out. Any wonder I was a sugar junkie? Now that I’m older, I do things a little differently. I choose not to invite in the sugar comas and confectionary indulgences like I did as a kid. They just don’t work for me anymore. So that means less baking and more basking in the light of my memories when I want to walk down candycane lane. 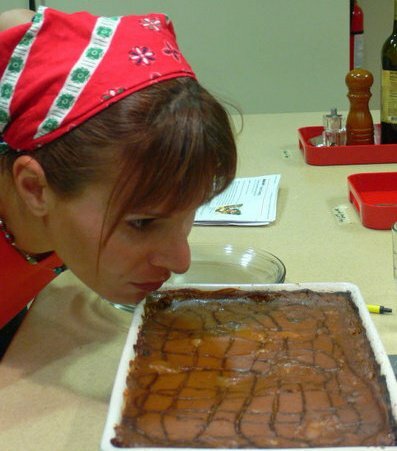 However, I do like to enjoy a little baking….I mean, a girl has to live – even if she is an “Off-White” girl. 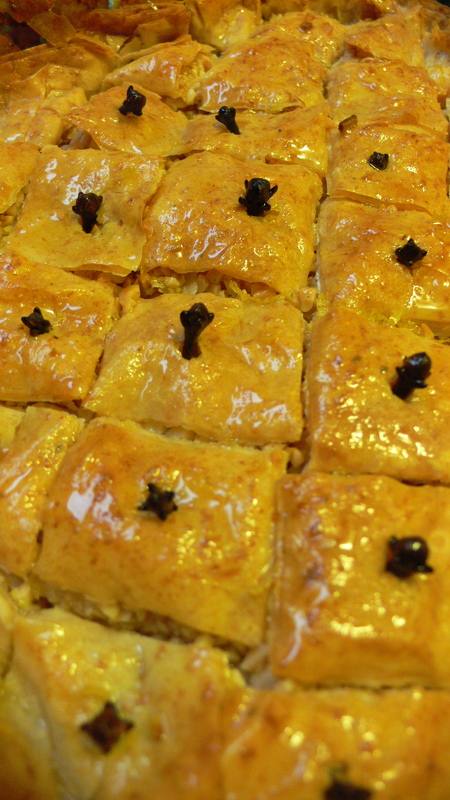 So, today what I share with you is a modification of mom’s homemade family recipe for Baklava. I’ve boosted its bounty a little bit with a few tweaks and changes, but I think you’ll still recognize the Mediterranean favorite here. It’s also a vegan dessert if you use vegan margarine instead of butter. 16 oz whole wheat Phyllo dough. I use Fillo Factory from the Coop. Preheat oven to 350. Roll out phyllo dough from the box. Slice in half and put one half back for later use. Use butter to grease a 9×9 baking dish. Lay out the phyllo dough so it’s nice and straight. Cover with a damp cloth to avoid over drying. Mix the nuts with the cinnamon and nutmeg. 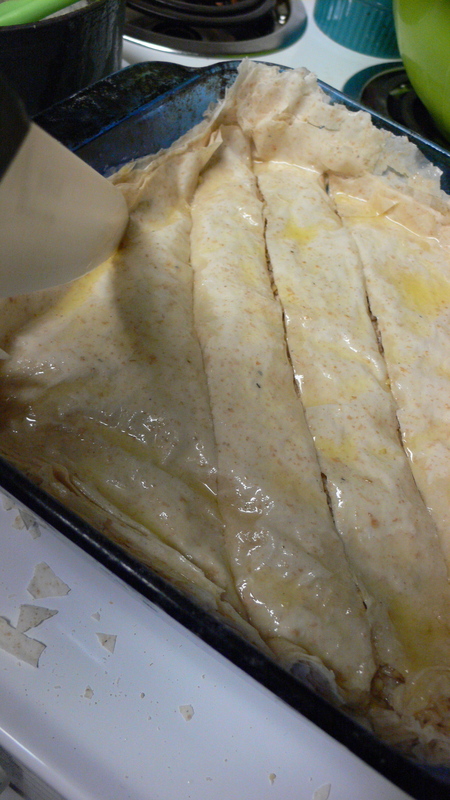 Layer 2 sheets of phyllo in the baking dish, pushing the dough to touch the edges. Add a basting of butter with a basting brush. Sprinkle on 3 Tbsp of nuts. Repeat this process until all the phyllo dough is used, except 6 layers. The top layer of phyllo should be 6 deep. Baste with butter, but don’t add nuts. 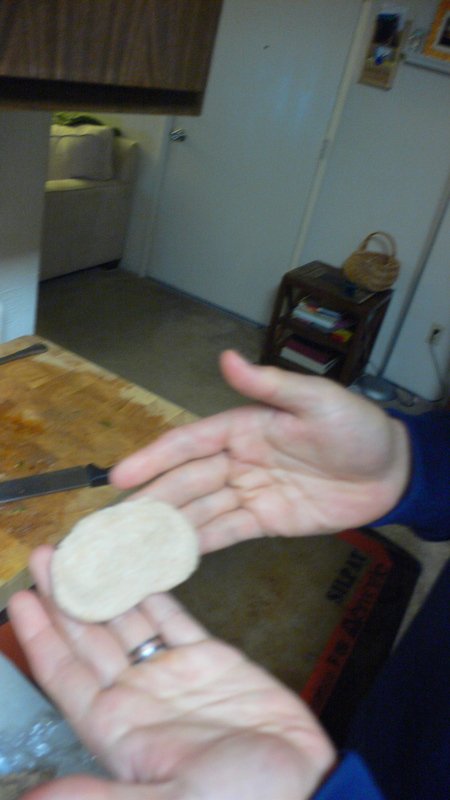 Trim any excess dough, which there will likely be some of. 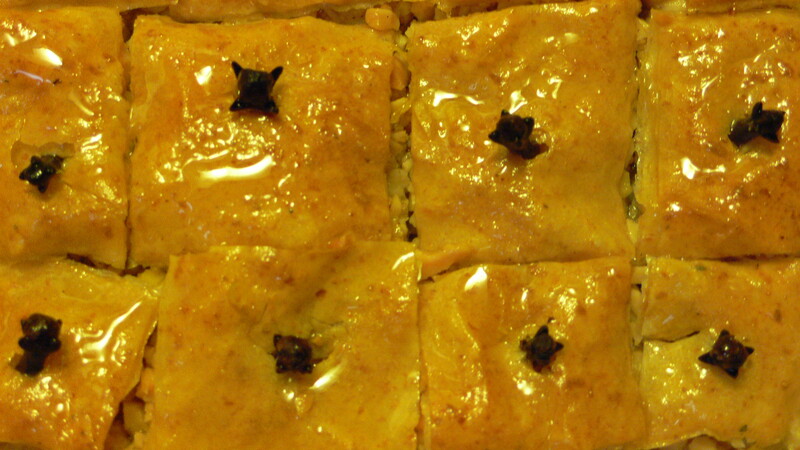 Carefully cut into 1” squares with a very sharp knife, being mindful not to squash the phyllo or tear to abruptly. Place one clove in the center of each square if you like. Bake for 25 minutes, or until top is golden brown but not burning. In the meantime, heat the honey on low. Add the lemon juice/zest and stir. Once the phyllo/nut dish is out of the oven spoon the honey mix over the top, make sure to let it drip between the creases where cuts were made. Thoroughly cover the top with the honey mixture. Set aside to cool. Once cool, you can cut the squares out and put in a cupcake holder to serve. This makes about 30 squares. Not another Pumpkin Pie recipe??!! Are you sick of seeing Pumpkin Pie recipes as we get closer and closer to T-day? If so, I apologize truly, but it’s got to be done. One thing I can promise you is that I be you haven’t seen too many that include coconut milk and are dairy free (as in cow/sheep/goat-based products. They still have eggs, but that is a different class of animals entirely). I’ve made the pumpkin pie so many times for so many people and they all love it. The proof is in the picture here: I am whipping it up for a cooking class ad the Davis Food Coop (Did you get your Diestel turkey for this year yet??) One thing to watch out for: it takes a bit longer to ‘set’ than a regular pumpkin pie, so plan to bake it a couple of hour early. This variation is slightly more mousse-like than its original counterpart. You can vary the amount of agave nectar, depending upon how sweet you like it. You can The pie filling is milk-free, for those who are lactose intolerant. Mix all ingredients in a large mixing bowl until smooth. Pour into a 9” pie crust. Drizzle 1 spoonful of blackstrap molasses on top of the pie (you can even write something if you’d like). Bake at 425 for 40-50 minutes, until a knife comes out clean from the center and edges are browned. Serve warm. Mix the three ingredients in a bowl and then press into the bottom of the greased pie baking dish. Oh goodness, I hope this works. The new WordPress format is confusing me. Maybe I’m still drunk on fish-head soup and forbidden rice that I just ate for dinner (no lie, but I skimped on the soup. I don’t do heads – just sampled the broth). Anyway, I made this amazing persimmon cake for our friend H’s birthday tonight. He hosted a lovely, albeit exotic meal (he’s Chinese – hence the fish head soup), and I knew that a birthday cake would surprise him. Being that we had a bunch of left over baking persimmons and H. really likes unique flavors, I pulled them together in what turns out to be a delicious cake that everybody devoured. We are talkin’ mid-western, meat-loving grown men along with a couple of us California ‘health nuts’ – they all loved it. This was definitely an equal opportunity cake! Fold in the wet ingredients to the dry ingredients. Mix thoroughly. The mix has the consistency of a muffin mix. Pour into a bundt cake pan and bake at 300 for about 40 minutes. You may need a little longer depending on your oven. Don’t burn the bottom or else it won’t be pretty when you turn it over. mix the powdered sugar into the lemon juice. Use a whisk to blend. Drizzle on top of the cake. Some of it will absorb. As soon as cake is covered, sprinkle the lemon zest shavings on top, spreading evenly. Let it set for 2 hrs and serve. Make sure you get a piece because it will go quickly! Kale is just about the coolest veggie ever made. 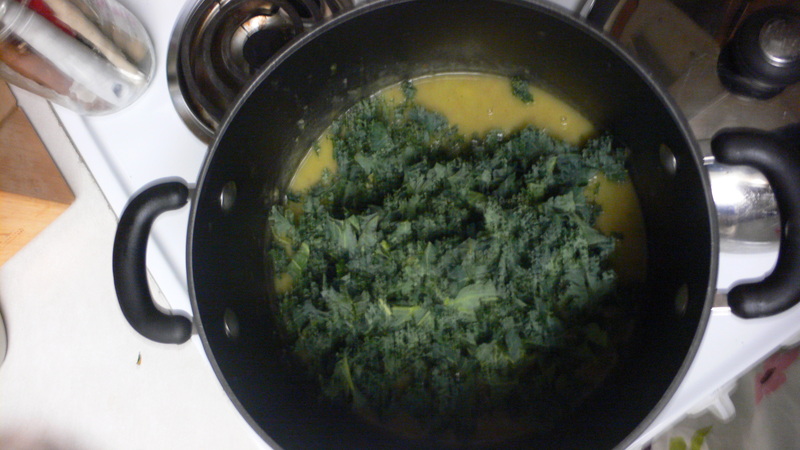 I sit here writing this post between spoonfuls of a delicious and easy to prepare soup I made that uses kale. Earlier today we threw some kale in the veggie scramble that fueled our bike ride and last night I struck up a conversation with a friend about kale and smoothies. What other veggie can offer so much diversity. In a large stock pot add about 1-2 Tbsp EVOO and the onion. Sweat the onion for about 3 min on med. heat. Add a pinch of salt and pepper. Stir for 1 more minute. Add the squash and mix. Let it cook for about 2 minutes and then add the stock (warm stock up to room temp before adding it). Add the herbs and bring to a “just boil” for about 15-20 minutes, until the squash is soft. 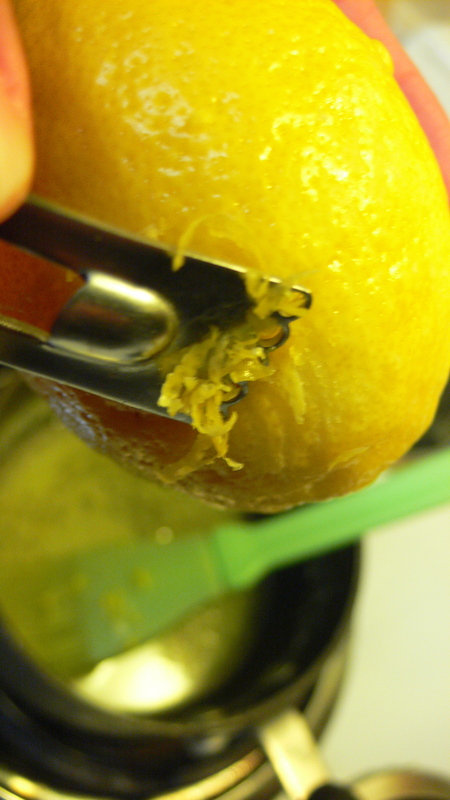 Now, if you want to make it thick and creamy, use an immersion blender to blend the stock with the squash/onion. Take out the rosemary sprig before you do this!. You can also put it in the blender but this is tedious. It will also taste good just as it is (chunks). After blending add the beans and cook another 5 minutes or so. Add the kale and another pinch of salt/pepper. 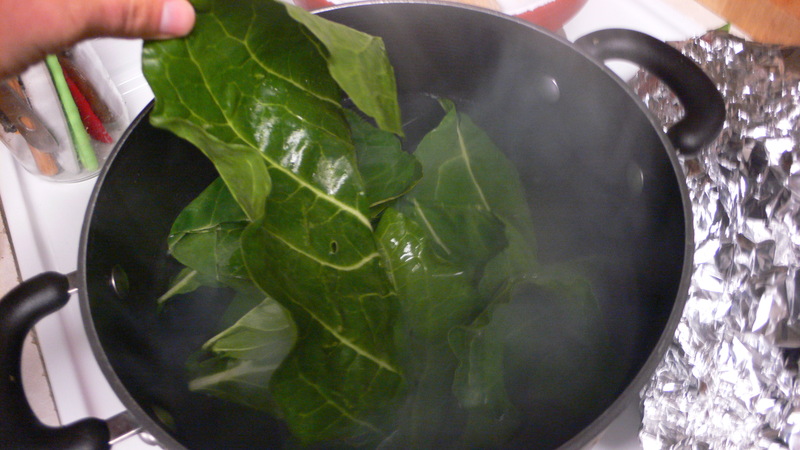 Cook an additional 5-10 minutes, or drop it down to low-med and simmer it for about 15-20 minutes. 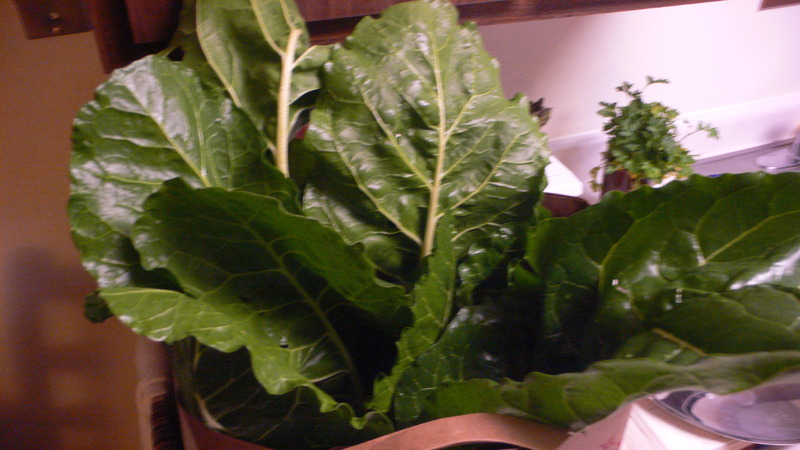 Avoid over wilting the kale. Serve in a ceramic bowl with a big ol’ soup spoon and all will be well on this chilly November evening. I bet a dollop of sour cream (or thick plain yogurt better yet!) would be tasty on this too. Okay, back to my soup! Fall weather. Crisp apples. Ceramic dishes. Yep, it’s getting closer to the snuggle season, and that makes me a happy camper. I’m so completely OVER summer, are you? I love that feeling of being both slightly chilled and warmed by the sun all at the same time. This feeling only happens during Autumn when I the sun is still shining, albeit lower in the sky. Fall also means cooking season begins. Double yay! I kicked off this past week by prepping for my Davis Coop Cooking class called “Stuffed with Goodness”. Between the stuffed sweet potatoes, stuffed zucchini boats, baked apples and stuffed peppers the eatin’ was good in the Tryon household this weekend. 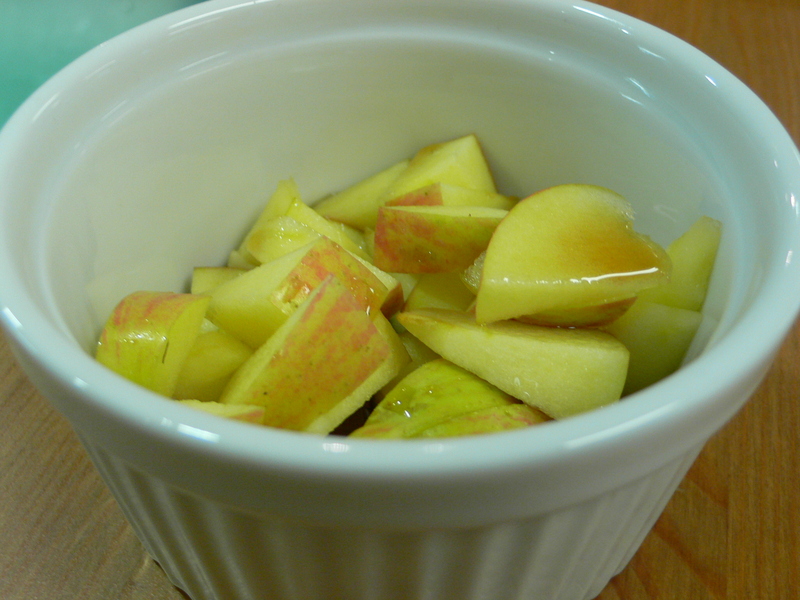 I want to share the recipe for stuffed apples because it’s so easy and so delicious. Sorry no pics. My camera is apparently on strike and I’ve yet to succomb to the world of the SmartPhone. Yep, dumb phone city for me still. I’m debating a smartphone but do I really need another way to stay dialed in? Yes. I do. I know it. You don’t need to remind me. Just the ability alone to upload pics to the blog will be work it. But, I digress. Back to my point. Before I share the recipe for baked apples, which by the way, are a great pre-snuggle dessert to enjoy before curling up with your honey to watch a movie, I want to share something else awesome I found. For the first time I went to check out the blog of the Pioneer Woman. Finally, right? I know! She’s fantastic. Talk about snuggle-fest. Between the amazingly adorable kittens, children, and her ‘to die for’ kitchen drawers for flours and sugars, I got all warm and tingly inside. Yes, just like when I snuggle 😉 If you aren’t familiar with her, she’s endearing right from the very start. She writes like she’s your best friend and she can cook like a champ, which always means a solid thumbs up from my vantage point. Okay, so first put these baked apples in the oven and then go visit Pioneer Woman. You’ll melt, I promise. 1/2 cup thick lowfat Greek yogurt. Mix the honey, nuts and spices together in a bowl. Fill each apple with the mix and let it topple out a bit. Drizzle a bit of honey across the top of each apple. Bake covered fat 350 for 40 minutes. Uncover and broil for 5 minutes, getting the tops carmalized. Meanwhile mix the additional honey with the yogurt. Chill. Once apples are removed, add a generous dollop of yogurt mix to the apples and enjoy. Did I mention that this dessert is Low-fat and gluten-free? Yeah!